Easyfresh Express incorporates comprehensive reefer rail services into our suite of solutions. This step forward in reefer rail logistics leads to a broader modality range and a higher level of commitment in several transport legs. As pioneers and first-movers in reefer rail solutions amongst the perishables logistics industry, we are designing a number or reefer dedicated rail links, from block trains to other more flexible multimodal services. Easyfresh is offering railing solutions in several regions and countries (Central Asia, USA; etc). Nevertheless Europe remains being a core area to develop the Easyfresh Express rail concept, given our strong presence in Europe, the Adriatic and the Mediterranean. 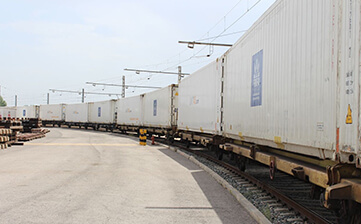 It is a fact that the development of rail freight is central to the European Union's transportation policy. Easyfresh has followed deregulation and market opening as options chosen by the EU to promote rail cargoes. Within that positive environment, the Easyfresh Express service portfolio is a unique and utmost specialized, but adaptable rail operator, focused to rail fresh and frozen goods.